According to the Israeli Kaan News Agency, it appears that Qatar will be financing an agreement between Israel and Hamas, in order to end the Great Return March processions. It said that Qatar would be transferring money to the Gaza Strip to pay salaries, and provide aid, in exchange for halting all protests in the coastal region and maintaining complete calm. 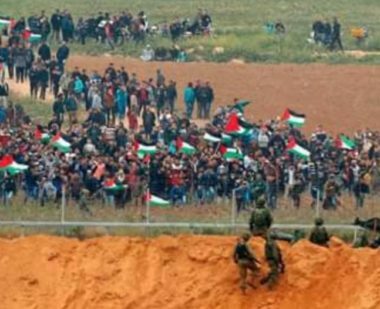 Hamas will be required to stop all protests near the perimeter fence, while Israel will also allow the flow of fuel transfer into Gaza, and help in providing electricity. The Israeli agency stated that Israeli leaders believe that the Palestinian Authority, headed by President Mahmoud Abbas in the West Bank, will be angered by this move, and will likely completely halt the transfer of government employees’ salaries. However, Israel controls all border terminals in the West Bank, and thus also controls all exports and imports, even collects money from Palestinian travelers crossing into Jordan, or heading back to the West Bank, and will be suspending the transfer of the tax and customs’ money it collects o behalf of the PA, to exert further pressure on it. A senior Israeli official said that the developments are considered a “strategic achievement for Hamas, for the first time, especially since international parties, including the United Nations, will directly be working with Hamas, and bypassing the Palestinian Authority in the occupied West Bank. The Palestinian Authority in the West Bank said that Hamas is acting on fully separating the Gaza Strip from the rest of occupied Palestine, and is trying to create a separate entity, in conflict with the Palestinian national aspirations, and struggle for full independence, sovereignty and geographical contiguity.